Collecting eight million employee responses from 100 companies spread over more than 60 industries across the globe, global professional services firm Aon has conducted its annual survey into employee engagement and found that “engagement around the world rebounded to its all-time high of 65 per cent of employees”. However, Europe is “the lowest-scoring region in the world”. Among the top improving countries globally are France, the Netherlands, Austria and Sweden. Aon suggests that improved engagement in the region can be at least partially attributed to the economic rebound in several previously struggling European markets such as Portugal, Italy and Greece. Among those markets that showed a decline, the United Kingdom has seen Engagement fall three points, according to the Aon the largest decrease among the 29 biggest global economies. “The murky path of Brexit is likely a contributing factor to this decline”, suggests the report. 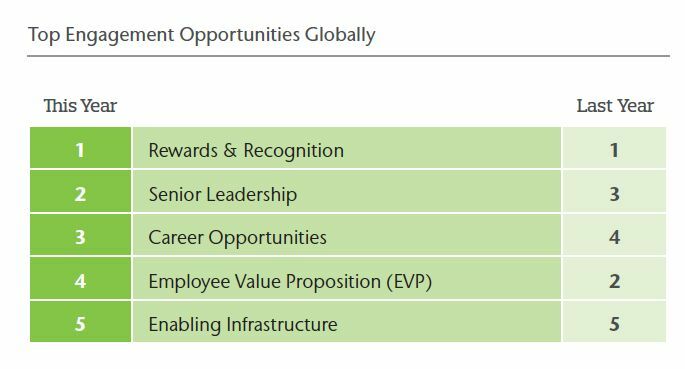 To accelerate engagement, Aon claim to have identified the five focus areas that have the greatest opportunity to impact employees’ desire to “Say, Stay and Strive”.